Are you ready to move from a content consumer to content creator? There are three types of content that are out there to create. My goal here is to help you figure out which method of content creation is inside of you, and help you get going. That’s why I document and share my processes. I want you to make the shift from consumer to creator. Things happen when you take action. And when that action is in the direction of being of service to a group of people, magical things happen! That’s what I want to show you here. 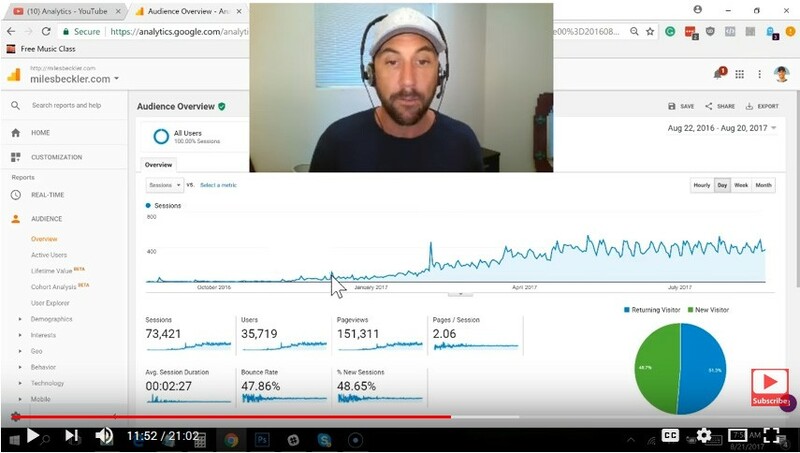 These are my results of year one of content marketing and the YouTube strategies which I used to get those results. 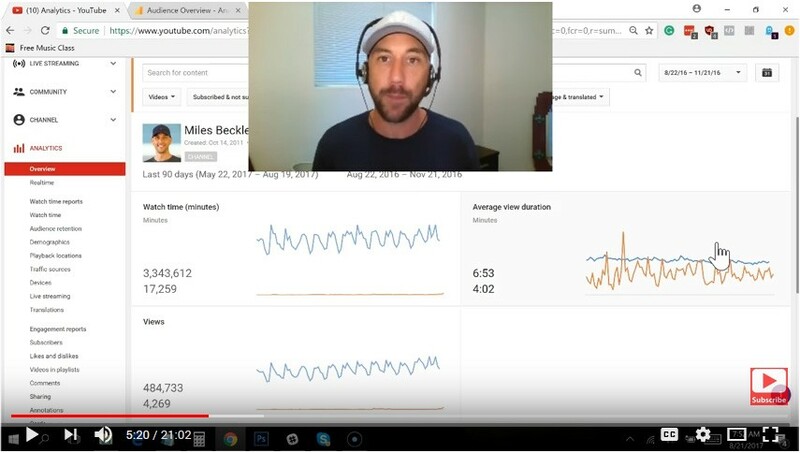 Within the first year I generated 26,747 subscribers with 926,000 views. I published a total of 244 videos. I started with 120 videos in 120 days, then took a month or two off, and then published 3 per week after that. After a while, the content starts having a compounding effect. As you continue to publish content that is giving value and more and more people start to watch or listen or read what you have, then those people start to interact with your older content as well and the numbers grow rapidly. Check out the comparison of the first quarter to fourth quarter year one numbers. I was publishing a video every day for the first 90 days, and still at day 91 was barely getting hundreds of views. Then look over to the end of the fourth quarter and I’m getting 5,000 or 7,000 views per day compared to maybe 1,000 before. The reason this is important is because when you’re starting this process you need to know that this works. You will have days that you really wonder if this will work for you. You will struggle with the negative mental speak. You will have all sorts of struggles and challenges. The main reason I was able to push forward is because I knew without a shadow of a doubt that this works… that the growth would come. My wife and I have done this before. We’ve built a successful online business using content marketing. We did blogging on that one because my wife is more of a writer, but it’s the same process and the results are the same. So, if you’re somewhere in your first or second quarter and wondering if it’s working, It is. You’re continuing to grow and improve. You’re becoming a better presenter. You are learning more about who you’re reaching and how to interact with them better. Pick one or more of the top site results for your search. Go back up to the search bar and type “site:” and copy and paste the website. Press enter and Google will bring up a list of everything indexed for that site. You can also go into the website and if there is a blog or content page, you can copy the url for that specific page and paste it behind the “site:” and get a list of what all is on just that section of the site. Go to YouTube and type in what you would search for if you were looking for the content you are creating and make note of the videos that come up. Go to Quora.com and see what questions people in your niche are asking. Answers.Yahoo.com is another site to search for questions and answers. Look for forums for your niche. Sort by replies to see which topics are getting the most engagement. Don’t spam yourself on forums, but engage in them. 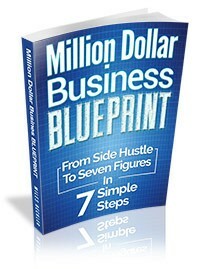 Go to Amazon.com and search for the top books in your niche. If you can, look inside the book at the table of contents. Don’t go plagiarize their content, but just use it to get ideas. Now, let’s take a look at my website. The blue and orange lines are the last 30 days compared to the month before at the end of one year. You can notice there are very slight differences. This is a good example of the compounding effect of your efforts. At this time, I hadn’t posted a single blog in the last 30 days. I am 100% lower on my efforts, but only 1% lower on my traffic. My website is still getting views because a lot of the posts over the year have keyword phrases that are hitting the top of Google. Now, let’s look at the first quarter to fourth quarter difference on my website. There was literally a 5000% increase in my traffic in one year. Here’s one last bit of website data to look at. You can see when my website traffic started to increase. This was about the time I was focusing on adding blog content. Now, I don’t write my blogs. I make my videos and pay a professional to transcribe and edit them into blog posts. You want to get your content onto all three, but you’ll most likely have one that you’re really good at. When you are content marketing, the first thing you want to do is figure out which method of content creation you’re most comfortable with. Then create systems in order to get that content out in other forms. I’m most comfortable with and best at creating videos. I didn’t actually know that about myself until I started my first year… I had never published a video before. In order to get the content I’m creating into all three of the mediums or “pillars” (video, audio, and written) I have systems in place for getting what I do well (videos) onto other platforms. I have professionals transcribe and edit my videos into blog posts. I rip the audio files from my videos and organize and load onto Libsyn, which is a podcast hosting service. After I have it laid out, I get it onto every podcasting directory I can get on. What if writing is your best form of content creation? speak out your written blog post for you. Use this audio format to create your podcast on Libsyn or Soundcloud. You can then use the same spoken content and add an image layer to turn into a video for YouTube. In the same way, if you are great at making podcasts, you could add the image layer for making videos and have someone transcribe and write out your audio for written content. I also had about 7500 subscribers to my steadily growing email list. I engage in affiliate marketing and after the first year could live off of that income alone. So, the point in giving you all this data, these statistics, is to show you without a doubt that content marketing works. It may work for you in 6 months, or maybe a year, or three years. But if you stick with it, you will get there. Keep giving value and over time you will build trust with those in your niche and will build a successful online business. I’ve worked with and coached dozens or even hundreds of people and have seen the same results many times. The most difficult obstacle to overcome is the mindset struggles. 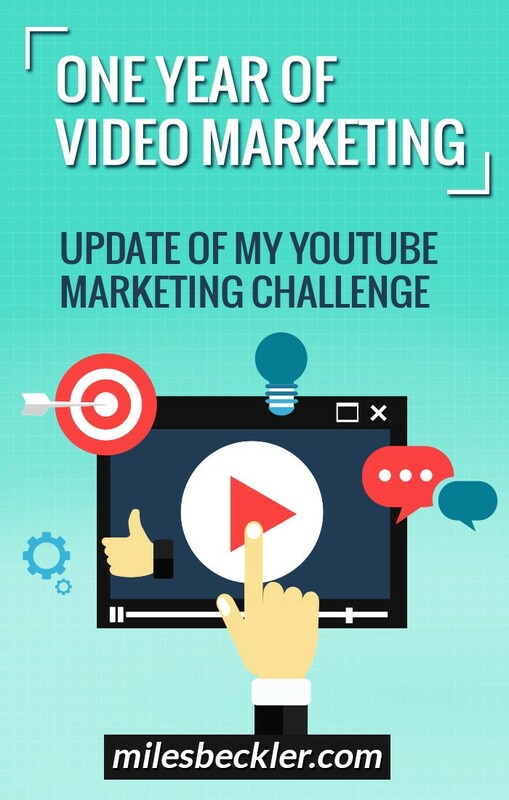 Hopefully these statistics will help you to keep on moving forward in your content creating or in starting if you haven’t started yet. Eventually, you will get to a point that it’s fun. You’ll wake up excited to make that next video or podcast or write that next post. You get to the point that you’re excited to be of service and not thinking about what’s in it for you. It’s not if it’ll happen, but when. I hope this one year journey has been insightful and inspirational. Hi Miles, I'd like to talk to you about working with you. I'm down on my luck and have the last $2000 to my name. I've spent thousands in cash and hours trying to make money online with various courses and mentorship and so far it's just left me broke and depressed. I gave up everything to try this and now I feel like my life is meaningless and I struggle to just wake up and face my failures. I know you are probably so elevated that you don't care about the little girls anymore but I'm hoping you can dig deep in your hear and hear my plea for help. I'm more than willing to pay you back 10 folds if you just please help direct me in the right path. I really need some help and real advice. I've been reading your blog and watching your videos and in my opinion you may be the last of the few who made it that may still be human enough to help another person in need. Please, please respond to me. I really need the help, I have 3 children and when the last of my money is gone, we are pretty screwed and getting back to work as a female, yet alone a black female is not easy... Oh yeah, I'm black and I hope that won't deter you from helping another human being just because of the amount of melanin I was born with. Thanks for your time. 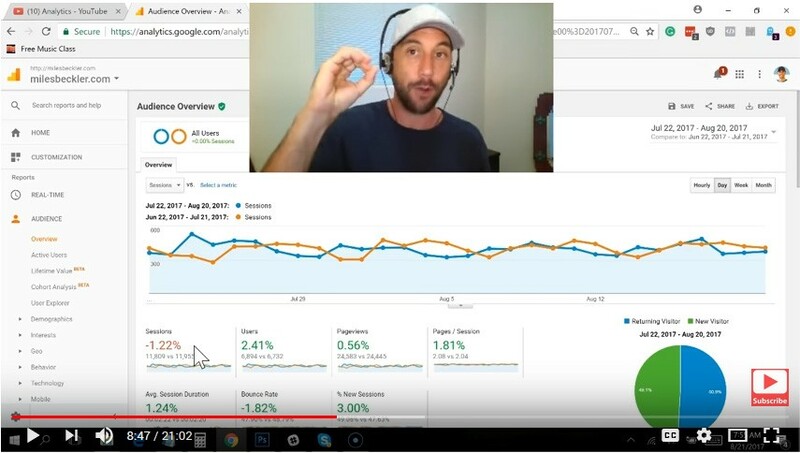 When I was flat broke and had to figure out some way to make money outside of a job, this is how I went about it: https://www.youtube.com/watch?v=p8JEFNMOg5Q&list=PL0sOKzn__yK1kG4iGeccovRMbFDJ4DXr_ That is a 3 video series that goes into the nuts and bolts... Doesn't cost much money to get this kind of business going but it takes a lot of effort. 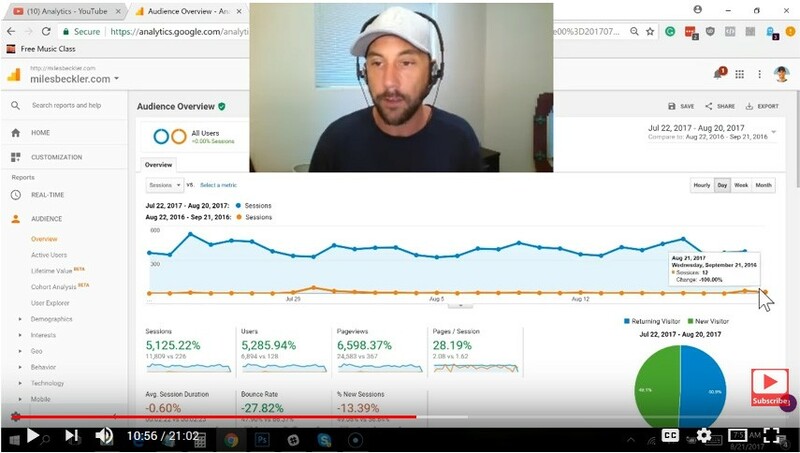 Miles: in one of your videos I heard you mention that in order to do SEO properly with blogs, you need to add SSL to your website. Why is that? How hungry for success are you? There is no such thing as 'weekends' and 'weekdays' to entrepreneurs. Thanks, Miles! I just started making videos. My first one yesterday received a whopping 30 views. Aggh. Seeing that your videos started about the same tells me to keep going. I can do 90 in 90 days and I know my followers are hungry for the info. My website gets about 41,000 page views per month, and about 100 new subscribers per week, (Thrive leads is amazing! ), but I have been terrible at monetizing them. Do you have any thoughts as to what people want most: 1) Courses, 2) Access to Premium Content? Thank you so much for everything Ive read so far at 2am, I will explain later why I can't sleep due to reading your blog. I usually don't to around throwing my email address just cause I wanted to leave a comment, but I'm glad to receive anymore great news about content marking or just business advice from you. Let me first thank you for being so honest about the fact that you don't write your blog content, cause Videos are more of your thing. Then you go on to explain the three different ways to engage in content marketing. I love this information because I was struggling with the question of should I make a blog when I already have my YouTube videos that I started in Jan of this year and left alone, Why because of every darn reason you said I would, lol. I found your blog (cause I wanted to see what your blog looked like through a video on why you liked wordpress but you didn't have your blog link, so I had to go searching through some of your videos n found it), Any who, I fell asleep reading your content on the main page, and woke back up around 1am and haven't stopped reading (yeah I should b sleep, ) but You have some of the best honest and valuable content I've read on starting this business that I TRULY BELIEVE WILL HELP ME SUCCEED 100% IN THIS. Ohhh and I love the fact that you constantly mention your wife, but so far I haven't read where u linked her blog, I know I will b checking you out and following your advice but Im sure she has some great information as well. Ohh, one last thing, Interesting you have so much free full advice, I say "Full Advice" cause most people reel u in with half advice, then throw up the payments at the end but they never get to the Point. Nothing is wrong with that, cause its all business. But you give a lot of valuable information very quickly. I wouldn't mind paying for your content cause you have already showed that its worth paying for. I never had heard of you until today but keep up the good work, keep speaking about your wife's successes and I will b following your advice. Glad you like the content!